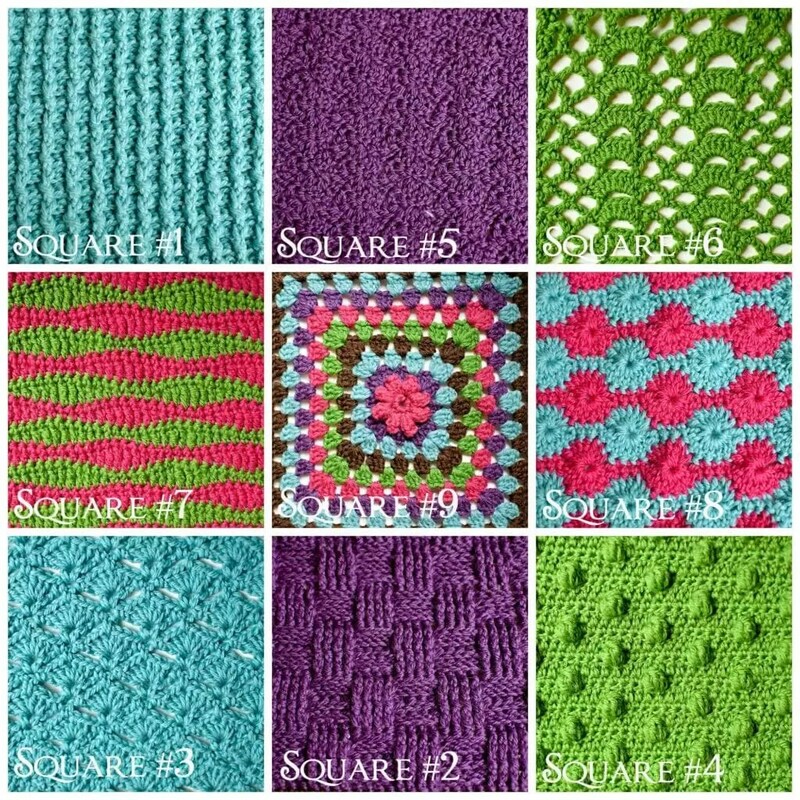 Let’s make the Cross Hatch Crochet Stitch Square! You are more than half way through the squares, way to go! Now we are getting into some fun stitches. This is the fifth block in the Crochet Stitch Sampler Baby Blanket CAL Sponsored by Red Heart Yarns and hosted by Marly Bird. You can click here for the first square, here for the second square, here for the third square, here for the fourth square. I chose the Cross Hatch Crochet Stitch square for this blanket because I liked the chance to learn about placing stitches in an unusual place. 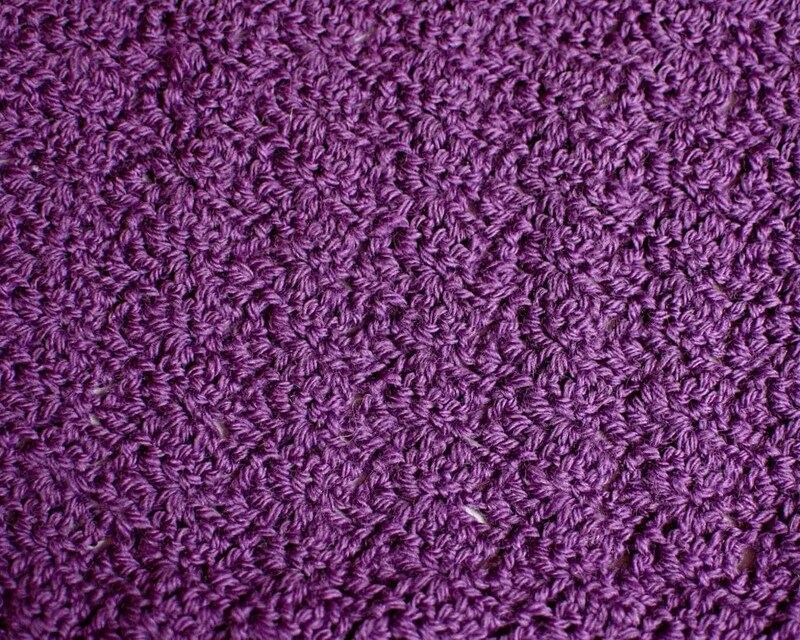 Plus, this stitch is solid without being dense. If you _over_ block the square it could actually be more open and lace like. Totally up to you and the look you are going for with your blanket. Using one of the 4 complementary colors. If you want to use this pattern stitch for another pattern you need to know how many chains are used for the foundation. For the Cross Hatch–Foundation chain is a multiple of 7 sts + 1. In class block: Ch 29, continue to row 1. Full size block: Ch 50, continue to row 1. This is the foundation chain amount I did for the full square in the sample blanket. This number of stitches will give you the same size squares as long as you use the correct hook size to get the size you want. Designer NOTE: The nature of this stitch is to be open so it could easily be made too big. If your squares are turning out much bigger than my 11″ by 11″ this might be one of the squares you use a smaller hook for and/or adjust the beginning chain amount. Also, USE a stitch marker as I show you in the video! It will help you keep your place! Row 1: Sk 3 ch (counts as 1 dc), 2 dc in next ch, * sk 3 ch, sc in next ch, ch 3, dc in each of the next 3 foundation ch; rep from * to last 4 ch, sk 3 ch, sc in last ch. Row 2: Ch 3 (counts as 1 dc), 2 dc in 1st sc, * sk 3 dc, sc in next ch, ch 3, dc in each of the next 2 ch, dc in next sc; rep from * to end, sk 2 dc, sc in tch. Designer NOTE: As you work this square and begin to think about joining it to the others you might think that seaming this block to the others can be a bit tricky. I talk about this on the HD Video. For this chart you will notice that the numbers on the sides count the rows. You can also use these numbers to let you know from which side you will begin reading that row of the chart. For example: Row 1 will be read from the right to the left. Designer NOTE: I find when working with a chart like this one that using colored pencils or a high-lighter to color in the stitches in a particular row helps keep me on track. I can better see what stitches go with what row which is vital. Please look at the chart below to see what I mean.